There are many testing methods that designers can use to help shed light on the actions users take in their product, even as early as in the prototyping phase. However, the majority of us still don’t do this regularly or systematically enough. There are many different reasons for this, including the complexity of the analytics process. Performing usability tests is one thing, but making sense of the data is another. There’s something seriously unappealing about dealing with raw, unstructured information. Everyone, UX designers included, prefers analyzing information that’s been ‘translated’ into a visual form. Humans simply process visual data better! Visual data is easier to digest, but more importantly, it helps reveal previously unseen patterns in user behavior. Visualization brings meaning, and meaning drives impact. Data visualizations help us process information much faster and it often reveals insights that would otherwise remain hidden. It plays an important part in the usability testing process because it helps UX designers understand user behavior, actions, and trends, and find solutions based on those findings to improve the design and development of the product. Simply put, data visualization helps to transform usability testing data into workable solutions. And we’re not talking only about graphs which are very useful for visualizing the results of quantitative user research. Equally important are different ways you can visualize more subjective and unclear data from qualitative user research, such as empathy maps. But sometimes, the bigger part of the usability testing and analytics process can be handled with the help of the right tool. When we built the Koncept app, we wanted to combine prototyping and usability testing in one tool and include the visual representation of testing data to simplify the process. Now, let’s look at one of the ways we have achieved this. The way people behave within a digital product is one of the most exciting insights we can get from user testing. 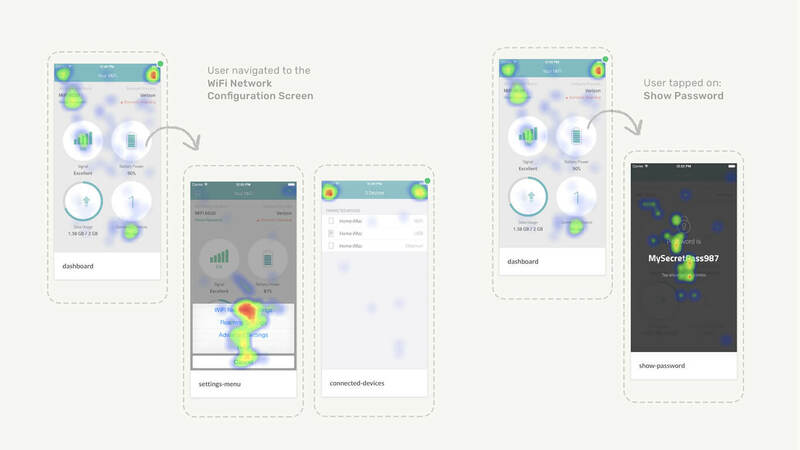 For example, an entire product prototype can be optimized by looking at how people interact with it, and we typically use heat maps to understand those interactions. With prototypes made with Koncept, you can test different UI elements, layouts, information hierarchy, and other app interactions. You can see, for example, where users clicked when they performed a certain task within your prototype via Koncept heatmaps. This enables you to observe the usability of your digital product without having to sit with users and record the entire test. You get all the insights, while users enjoy the convenience of doing the test remotely from their home. When users complete the tasks you assigned to them, you need to be able to analyze at least the following metrics: how many users accepted and how many successfully (or unsuccessfully) completed their tasks, as well as the average task completion time. But more importantly, you need to be able to see how users interacted with your screens. This level of insight makes it easy to quickly iterate, eliminate usability issues in your design, and improve your app’s overall usability. Visual data is also useful for reporting usability testing findings to your team, your clients, or your executives. When you are presenting to an executive audience, they don’t always have time to digest the data you present so the visual representation of the findings will help. Usability testing tools that provide visual reports are essential for helping UX designers make quick, informed design decisions. They show how users interact with a product which takes a lot of guesswork out of the UX design process, de-risking the development and launch of new products.